The viewing tower on White Mountain (Bílá hora) was built up to a height of 43 meters on the border of Kopřivnice and Štramberk (557 MAMSL). Its form recalls the symbol of the structure of DNA, the so-called spiral of life. 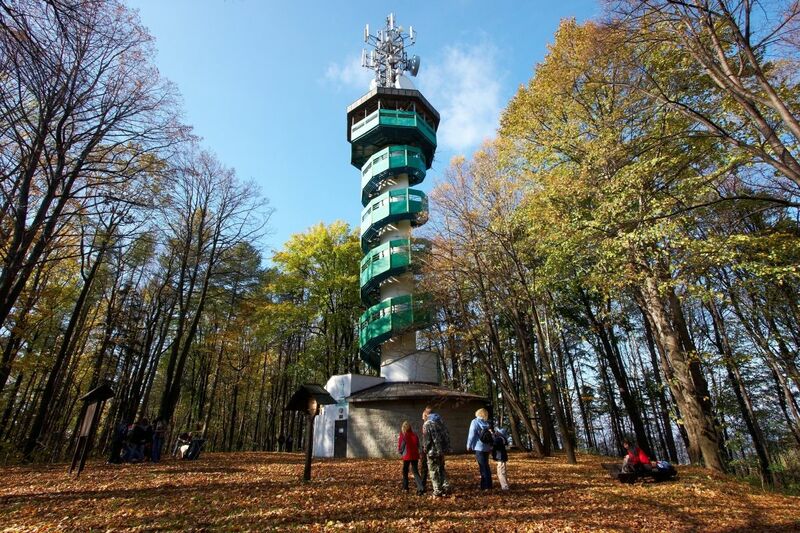 In good weather the viewing tower offers views of the nearby Beskydy and Jeseníky mountains. White Mountain, formed by Carpathian flysch, which is characterized by layers of sandstones, limestones and claystones, is the highest peak of the foot part in the Silesian-Moravian Foothills. 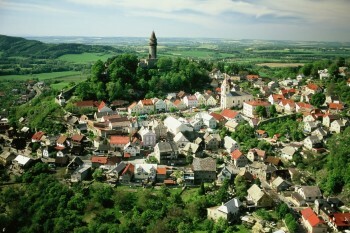 A separate massif above Štramberk and Kopřivnice exceeds its surroundings by 160 m. MUDr. 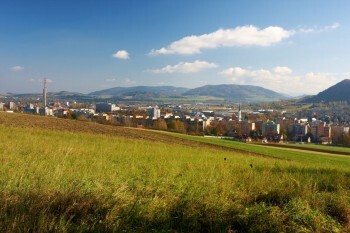 Adolf Hrstka, a doctor and local history officer working in Štramberk and later a mayor in the 1920s, came up with a plan to build a stone cairn with a memorial to the victims of the First World War, which would also allow visitors to White Mountain the best view of the region but the project was never implemented due to a lack of funds. White Mountain got its viewing tower at the turn of the millennium. Construction of a multi-purpose tower started in October 1999. It was ceremonially opened April 28, 2000. The current viewing tower has a modern architectural design and uses the symbol of DNA structure. This winds along the concrete shaft to the top of the tower. The viewing platform is at an altitude of 583 meters. In the case of good weather you can see Ostrava and the highest peaks of the Beskids and the Jeseníky mountains from the tower. The platform of the tower has a capacity of 500 kg/m2 and the usable area is 42 square meters. It means that the viewing platform could bear more than 200 adults at one time if the number of people in the tower were not restricted by fire regulations. The tower is designed so that the top deviation would not be more than 27 cm from the vertical axis at a wind speed of 176 km/h. The staircase is made up of 134 steel and 27 concrete steps and 520 t of concrete and 39 t of steel structures were used for its construction.